The dream of all Brian May fans has finally been realised: the Super is as genuine a recreation of the Red Special as is realistic for what is a pretty good price. Impressive attention to detail. Good price. We've been privy to the developments of the BM Super for a while now and we're very happy to finally see the finished article on the market. As with all current official products that bear the Queen legend's name, Brian May's tech Pete Malandrone and Aussie luthier Greg Fryer have been involved from the beginning of the R&D process. The Super is built in Japan by luthier Kazutaka Ijuin, who is well-known among Queen guitar fans from his KZ Guitars operation that has produced some of the best copies of Brian's Red Special. The concept here, however, is to fill the gap between the very affordable BM Signature and the Brian May Replica - the latter painstakingly made by East Anglian maker Andrew Guyton - so the Super does include a number of compromises in spec when compared to the original. There's an interview with Greg Fryer up on the BMG website that goes over each and every nuance in detail, something that space forbids us from doing, but here are some of the important highlights. The body, although of the exact same shape and dimensions as the original, is fashioned from mahogany rather than the veneer of blockboard, oak and mahogany taken from the now legendary fireplace by Brian and his father back in the mid-sixties. The fingerboard here is of heavily yet expertly lacquered ebony, rather than the original painted oak, and the real anoraks will notice that the Super's mahogany neck is glued-in rather than secured by a single hefty bolt. To be accurate, the original's neck was intended to be glued in, with the neck material actually extending well into the body and stopping just short of the bridge pickup. "We've been fortunate enough to have played the original Red Special on several occasions over the years, and the BM Super gets incredibly close to the real thing." 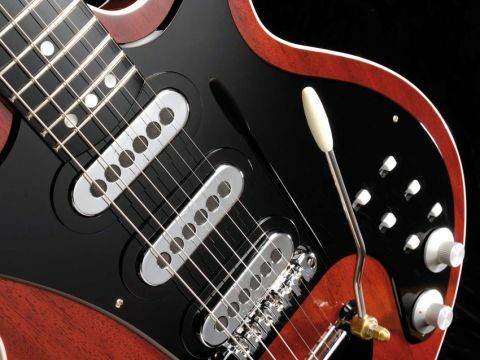 As it is, the neck is arguably the Super's most interesting feature. Its dimensions are exactly those of the original and it is subsequently huge. The best way to describe the profile would be that of a 'V' with its apex flattened (imagine a trapezoid cross-section) and, although it shouldn't be quite so comfortable on paper, it's truly wonderful to play. With a nut width of just over 45mm, a zero fret and a familiar old Fender-type 184mm radius, the benefits to overall tone of necks of this size shouldn't be underestimated. The trio of Burns Trisonics have been tweaked electronically to resemble the originals more closely and the vibrato array, which is impressive in its authenticity, is set up perfectly for those necessarily subtle wobbles. The team has opted to use a Wilkinson roller bridge to keep costs down, rather than custom-manufacturing a copy of the original's - do see the website for more information and background on that. In order to get close to recreating Brian's tone, you're obliged to use a treble-boosted Vox AC30 turned up full and, as you'd expect and hope, the Super apes the soundscapes of its creator very well using this set-up. The more notable pickup selections - the bridge/middle in-phase rhythm tone or middle out-of-phase with neck Bohemian Rhapsody solo tone, for example - are loud and proud and, enormous though the neck is, not once did we wish it was easier. The highly lacquered ebony 'board aids a smooth vibrato no end and, once we'd stretched the strings in, there were no tuning problems to speak of (custom-designed zero fret - a pet hate of this reviewer - notwithstanding). Such is the tonal versatility of this and all official BM copies that it would be remiss of us not to consider additional uses to which it could be put when your Queen tribute band is off the road. In a nutshell we'd say it's the true halfway house between the tonal wonders and traditional uses of a Fender Strat and Gibson Les Paul. You can genuinely change from a creamy, warm LP-style neck tone to a gnarly single-coil twang with the flick of a switch: all three pickups on and in-phase for the former and, keeping the same setting, a simple reversal of the middle for the latter. And though overall results are much improved when utilising an all-valve amp (as it can be further driven by the guitar's high output), even a solid-state unit and decent overdrive pedal can produce very useable, if not wholly authentic, tones. Arguably the most famous non-Queen sound the Super is adept at producing is the unusual Peter Green/Gary Moore Les Paul out-of-phase tone, but with a total of 27 possible selections - albeit including several repetitions and mute settings - the Super's versatility is unmatched. Those pesky white selector switches are slightly prouder here than on the original, and it does take some time to get used to changing selections mid-song. However, as with the other quirky designs and features, the procedure seems to make perfect sense. There are a number of readily available amps that both boast the requisite EL84 power tube sections and, more importantly, have controllable volumes. We are happy with the sound of a stock Marshall DSL401 that we both boost with a Fryer pedal and the amp's gain controls; it gives a musical feedback and loads of sustain without our windows rattling. Although lacking the depth of a full-tilt AC30, the compromise is made more palatable by the guitar's ability to produce the right type of signal and authenticity of performance. The fact that both Brian and second guitarist Jamie Moses used the Super throughout the recent Cosmos Rocks tour is testament enough to the guitar's quality, and we'd suggest that the company has realised its goal of providing a legitimate choice sited between the Korean-built BMG Standard and the nirvana of the Guyton Replica. We've been fortunate enough to have played the original Red Special on several occasions over the years, not to mention the Guyton Green Special, and the BM Super gets incredibly close to the real things' feel. Sure, there are compromises with the construction that take it away from a 100 per cent pure recreation but, as the literature says, commission Andrew Guyton to build you one of his beautiful guitars if you feel you absolutely have to get even closer to the Red Special. The Super is very well-made and, more importantly, is much closer in vibe, tone and feel to the original Red Special than any hitherto realistically available copy. We were knocked out by the original Burns BM back in 2001, and, although the BMG Standard has taken that premise forward, it's now the Super that represents the guitar that May fans should strive to own.